I love these pictures. Mostly, I love the contrast of colors. The reds, and browns seem to highlight the blue of both boys eyes. They are both such a contrast to me. Anyway, I really wanted this to be a special LO. I just found the Kraft FunDay collection by MME. I was pretty sure they would work well for what I wanted to do. I am very happy with how this came out. I started with a sketch from the SLS eBook, but adapted it to fit the photos. As it turns out, I am able to enter this LO in 4 different Challenges. 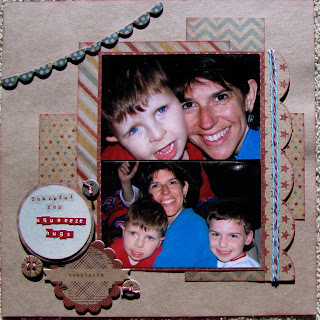 ScrapFit WW #23, use Kraft, Club CK ThanksLiving #1 and January Pinterest, and lastly for ScrapHappy January Inspiration. For now, the journaling will be for me and I will be writing it on the back. We love our Squeeeeze Hugs in our family. I am very thankful to have them. I was able to finish another project today. This is for the Club CK Jan/Feb '12 Issue Challenge #5, Use the colors brown, purple and teal on your LO, inspired by the cover of the CK Magazine Cover. I was not afraid! I love purple. I just don't have a reason to use it all that often in a house full of boys....Oddly enough, both the lamp and the bowl in these photos had purple in them. 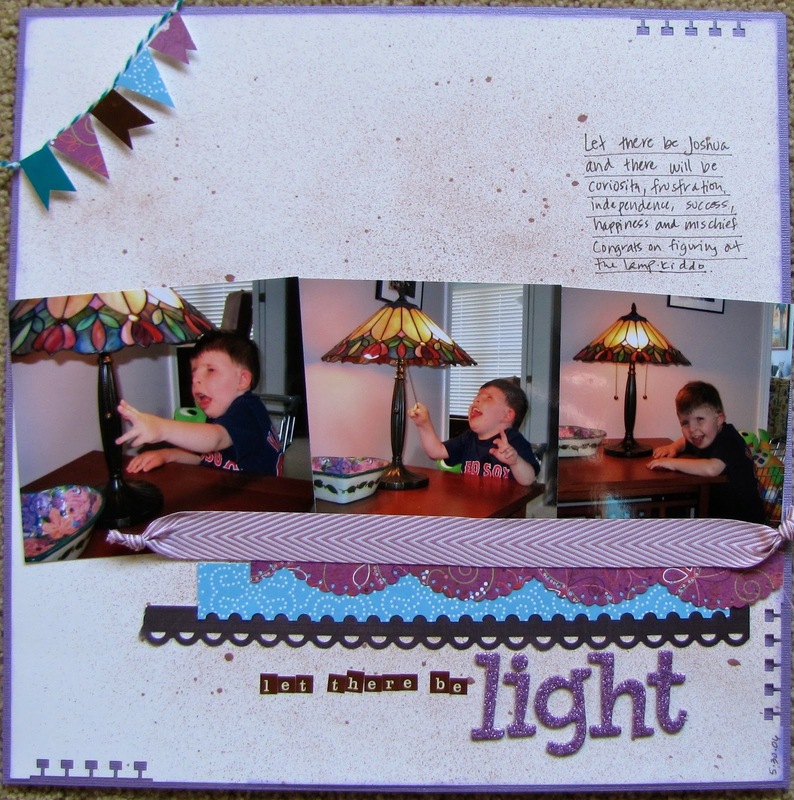 By using the purple and teal, I think it made the lampshade stand out, but didn't overshadow my son in action. That silly, curious, proud little boy. I pulled scraps out of my bin, Basic Grey, SEI and Creative Imaginations, Bazzill CS, used a few different EK Success and Fiskars punches, some of the banner is Echo Park stickers, twine, ribbon, Glimmer Mist, Cosmo Cricket mini alphas and Thickers. Volia! Another LO that makes me smile. Yay - really nice LOs! I really like that shade of kraft - I didn't know there was such a pretty shade. This is terrific! You rocked the kraft paper...it's perfect for this! Thanks for working out with us at ScrapFIT! way to go and great page!!! love the kraft and fun banner!! great layering!!! thanks so much for working out at ScrapFIT!!! Check you out---wrapping all those challenges into one! Way to go, Devra! Great work!